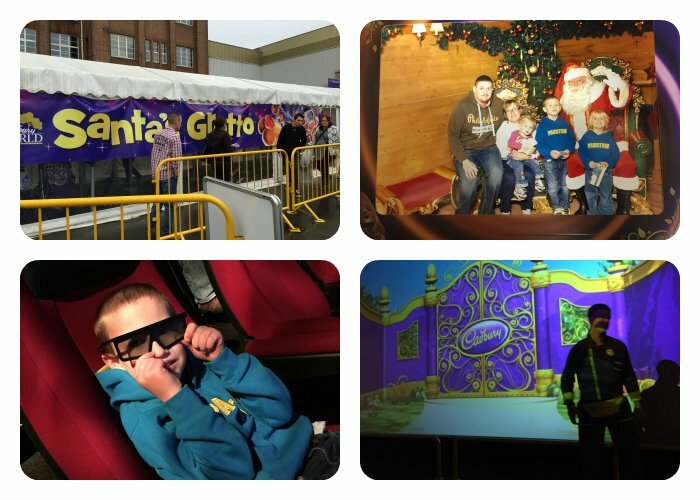 Last Sunday me and Mr M&TTT were very excited to be able to give the tiny 3 a nice early christmas surprise, a trip to Cadbury Worlds christmas celebrations. Our 1st surprise for them was a visit to see the big man himself (no not mr cadbury) Santa claus. As we were there quite early there wasn’t a queue and we got to see santa quite quickly. However as the day went on we did notice the queue building up. JR and TP were each gifted a stationary set and LA was gifted a teddy from santa. There was a magical touch where it looked as if it was snowing outside. 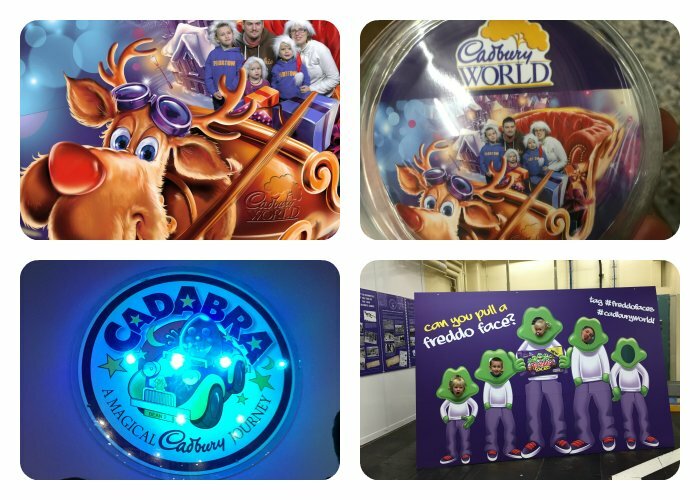 We then headed to the new for 2014 4D chocolate adventure ride with motion seats, freddo the frog invites you into a magical chocolatey world of adventure.You’ll meet some of your favourite chocolate characters from the famous cadburys advertisments. I won’t give too much away as it will spoil the surprise. It was then time for a spot of brunch, and this is where the cadbury’s staff amazed me. LA can’t eat milk, or milk products and all the provided sandwiches had butter on them so the chef made her a plate of her own ham sandwiches that were milk free at no additional cost. I was also told that they try to cater for all major food allergies. 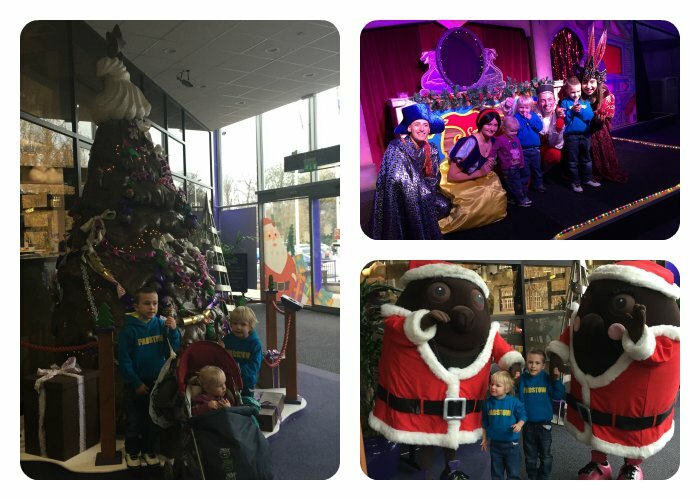 After lunch we went round to watch the pantomime Snow White and the chuckle beans and fantastic take on the pantomime classic Snow White and the seven dwarfs. Each show lasts around 30 minutes and has every aspect of a pantomime that you would expect from jokes, to silly songs. My 3 were absolutely enthralled by it. Afterwards we were even lucky enough to be able to meet the cast. JR decided his favourite character was The Evil Queen and TPs favourite was muddles. It was then time to take the cadburys world tour, the purple plant area was closed as it is being transformed into a new attraction for 2015. 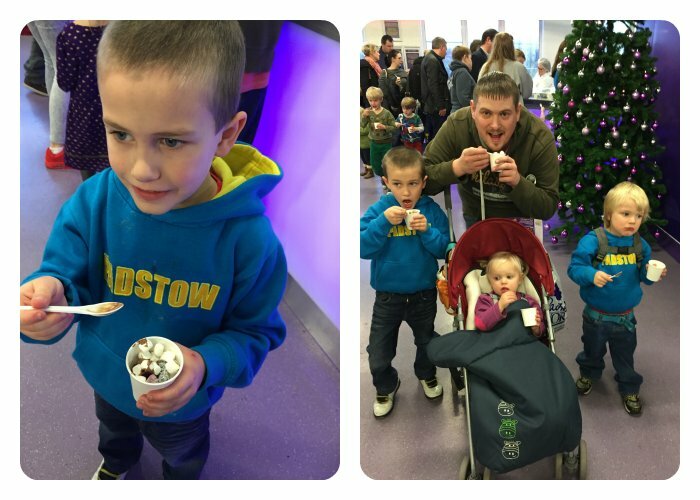 We each received 4 bars of chocolate through the tour and a cup of warm melted chocolate where you could choose 2 toppings. LA received a cup of jelly babies and a cup of marshmallows as she can’t have milk chocolate. We had fun in front of a green screen having our photo taken in santas sleigh and also riding the cadabra ride in a chuckle beanmobile. I was concerned that LA would be missing out with the free chocolate, and being so close to christmas I was worried that i wouldn’t be able to get her anything affordable from the gift shop as a replacement, but the lovely people at cadburys world have already thought about that and you can exchange your chocolates at the reception for a voucher to use in the gift shop, proving Cadbury world really is accessible to all. 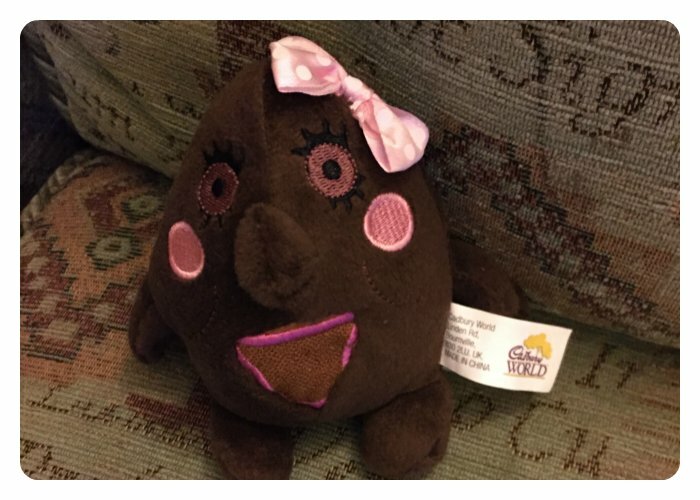 We chose this cute little chuckle bean for LA, and it has been by her side ever since. Disclosure: We were given free entry to Cadbury World, all the attractions and a commemorative photo free of charge for the purposes of this review. All words, opinions and photos are my own. This entry was posted in Days Out, My Stuff, Review, The Tiny Three.